QUEENS VILLAGE, Queens (WABC) -- A memorial service was held Saturday to remember an NYPD officer killed one year ago. The ceremony in memory of New York City Police Department Detective 1st Grade Brian Moore, who died in the line of duty May 4, was at Plainedge Park in the Town of Oyster Bay. A statue was unveiled and a building dedicated in his honor. "This memorial statue and building dedication, in the community where he grew up and lived, will stand as a permanent tribute to a young man who touched the lives of many," Town of Oyster Bay Supervisor John Venditto said. "It will also serve to honor the memories of those who made the ultimate sacrifice while defending this nation and protecting its citizenry." 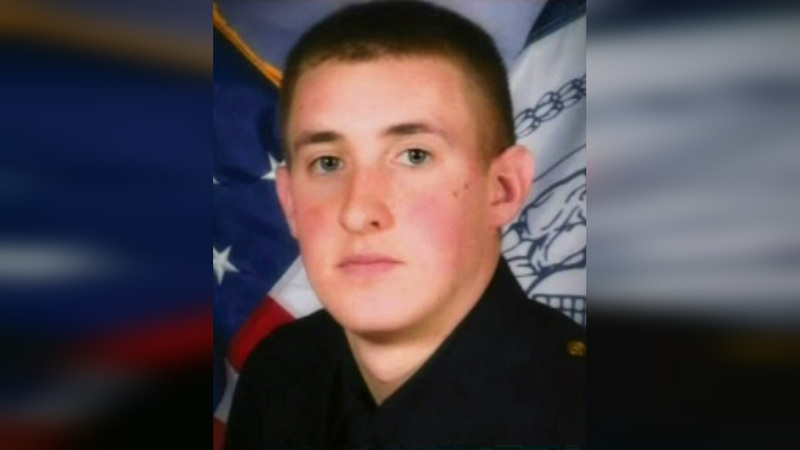 Moore was 25 when he died, but was already a decorated New York City police officer with more than 150 arrests. The Plainedge School District Athletic Center was named in Moore's honor. "Brian will always be one of Plainedge's own and we can think of nothing more fitting than to have the district's athletic center forever bear his name," Superintendent Edward A. Salina Jr. said. "He played ball and attended school on the very grounds where this building is situated." Moore was shot in the face while trying to stop a man with a gun while on patrol. Demetrius Blackwell will stand trial for the officer's murder. The intersection of 222nd Street and 92nd Road in Queens Village, the neighborhood where Moore died, was renamed "Detective First Grade Brian Moore Way" earlier this month.